Since each of the last six polls, including today’s, has been within margin of error of a Boris lead of 5pts, it’s possible that the narrow lead just reflects random variance. But digging beneath the numbers suggests a more decisive trend. 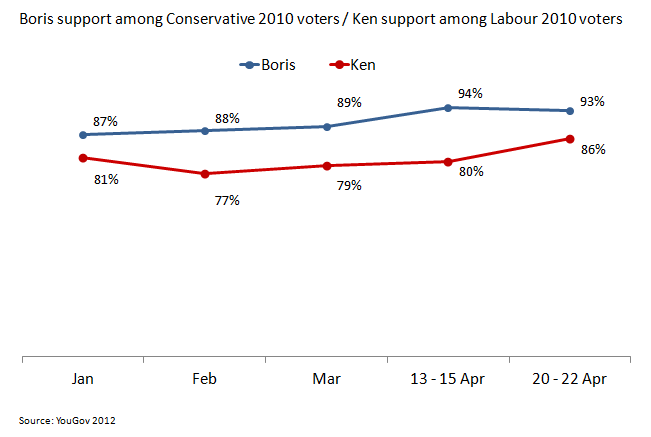 Between January and mid-April, Boris began scoring much better among 2010 Tory voters than Ken did among 2010 Labour voters. The gap became as wide as 14pts. An explanation for growing support among previous Tory voters could be Lynton Crosby’s style of ‘get out the base’ campaigning. This may in part be a product of Labour’s current support in London now being at its highest point this year, 50%. But even if Labour don’t increase their national support in the capital any further, there is still more space for Ken to increase his share among previous party supporters than there is for Boris to do the same. Last month we saw that Boris had just made a significant gain among people who wouldn’t vote Labour or Tory in a general election. What has the Tory poll collapse meant for the leaders’ ratings? It’s well established that the Tories’ ‘worst week’ – the granny tax, 50p tax cut, donorgate, pastygate and petrolgate – hit them badly in polls. Labour’s lead has been up to 10pts, with the Tories scratching around in the low 30s. 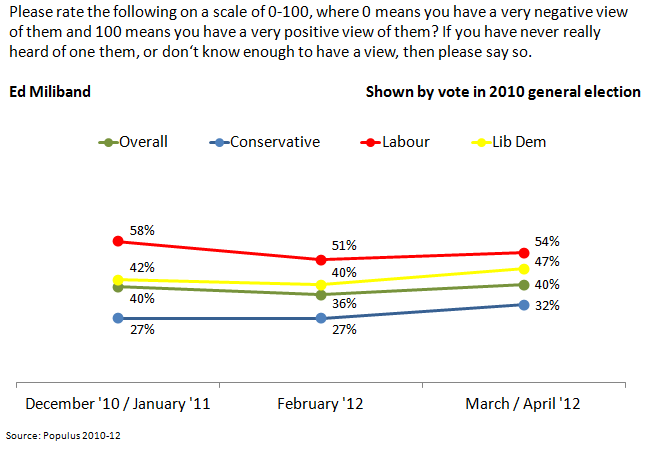 But the impact on the party leaders’ ratings hasn’t been that straightforward. Surprisingly, Cameron emerged largely unscathed, although the others got a boost. For this comparison, I’m looking at data from three Populus polls. Each asked respondents to score how ‘positive’ they feel about the leaders, on a score of 0-100. The first poll comes from December ‘10/January ’11, the second from February ’12 (before the worst week), and the third from March/April ’12 (after the worst week). The groups I’m looking at are based on vote at the last election, so these should be comparable across the three polls – though they often won’t be current party supporters/voters. Despite the impact on the Tories’ vote intent score, Cameron himself seems to have been barely hit by the worst week. But what’s striking is his score had already fallen sharply among his own party’s voters. While he still remains the most popular leader among his own voters, the gap now is much smaller than it was 15 months ago. As might be expected, Miliband’s scores have gone up among all groups since the worst week, with the largest overall increase. Does the Evening Standard understand its own Boris vs Ken poll? 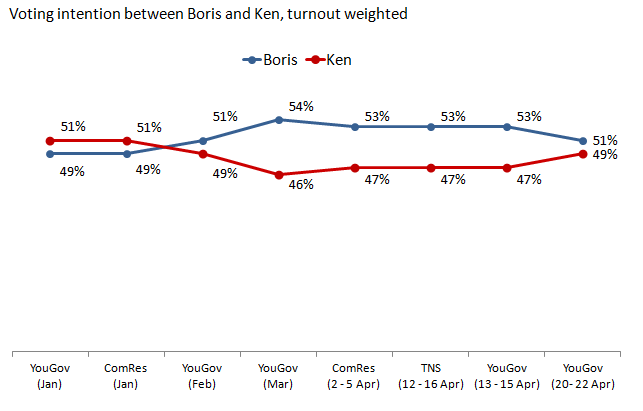 Posted in Bad polling, London, Media on April 10th, 2012 by Leo – Comments Off on Does the Evening Standard understand its own Boris vs Ken poll? I try not to write much about polling methodology. I doubt it’s of interest to many people, and besides, Anthony Wells does it much better than I do. But there’s been some truly awful reporting today of the latest London mayoral poll, and it’s time to look at weighting and so on. According to today’s Evening Standard, their new ComRes poll shows “a dramatic slide in Mr Livingstone’s support after his argument with his Tory rival over tax in a radio station lift”. They go on to say that those “interviewed before “liftgate” last Tuesday morning were split 50/50 between the two candidates. But those surveyed afterwards divided 60/40 in favour of Mr Johnson.” ITV also reported it with the same angle. This all sounds very plausible and interesting, but it’s in fact a bad misrepresentation of the poll. The issue is, the poll was never designed to show how opinion changed after shoutyBorisgate. Of course it wasn’t: the poll was set up without anyone knowing there would be any event to compare ‘before’ and ‘after’. If you do know that an event is coming, say a leaders’ debate, you can run two separate polls, with comparable samples (or even, with the same people), and see how the results compare. 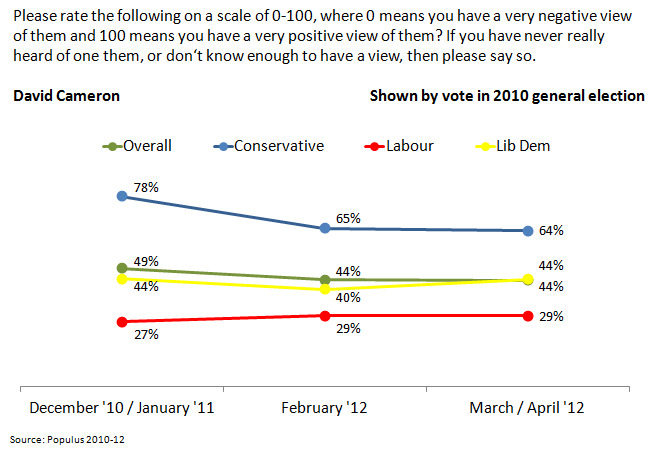 But this ComRes poll doesn’t do that. Instead, a little over three quarters of the poll was conducted before the interview, and the remainder after. Nothing looks to have been done to make sure the samples before and after were comparable. So we’ve got two groups of people. In terms of how they voted in the last general election (nothing to do with Ken and Boris), the first group has 29% Labour voters and 27% Tory voters. The second group has 26% Labour voters and 32% Tory voters. A Labour 2pt lead vs a Tory 5pt lead. We then ask them how they’d vote in the London election, and are supposed to be surprised when the group with more Tories say they’re more likely to vote for the Tory candidate! This post was written for the Green Alliance blog,to coincide with the launch of a paper on public opinion and the environment. Coverage of public opinion on climate change is never just about reporting numbers. Without appreciating the need for journalists to tell a story, we can never really understand why climate change polls are reported as they are. Over the last decade, two distinct narratives have been told about what the public think of climate change. Each of these narratives has been so dominant for a time that it has been difficult for alternative views of public opinion to get much attention. The first, which dominated for most of the noughties, was that climate change was increasingly settled in the public’s minds as a great concern. Polls on climate change were rare for much of the decade, but when they did appear in the media, the coverage tended to acknowledge that the public was worried, although perhaps unsure about the risks or about possible solutions, as in this Observer article. As a result, there was little prominent dissent from the view that climate change was becoming a more important issue for most people, along with a belief that the world needed to take decisive action. But by the end of 2009, this prevailing narrative about public views on climate change had given way to a very different account. It happened quite suddenly, around the time of the COP15 in Copenhagen. Now, the dominant frame was that growing numbers of people doubted the existence of serious man-made climate change, and that there was increased resistance to measures to tackle it. Opinion polls were important to the development of this new account. For about a year, from late 2009, polls were repeatedly used to show the same narrative: that fewer people were now worried about climate change. The sheer weight of polls, reported across the media, gave the overwhelming impression of an ongoing change in opinion. But this was misleading: in fact, there appears to have been a one-off fall in concern about climate change, which happened between November’09 and January ’10. The difficulty in understanding opinion lies in the fact that media outlets want to report their own polls, as an exclusive story. They’re much less interested in repeating polls that another newspaper or broadcaster have commissioned. So over a period of several months, we saw different polls in outlets from the Daily Mail to the BBC and Guardian, which essentially restated the same phenomenon as if it were a new finding. The result was a powerful new narrative, that concern about climate change was experiencing an ongoing decline. There are two reasons why it’s useful to see this as a new dominant narrative about public opinion, rather than as straight-forward reporting of opinion.